Everyone knows this logo, many people have seen it on Tee shirts and many even have this iconic Woodpecker inked on their body, not many people remember that he was a Man beyond his years in mechanical ideology,but clay Smith was an unbelievable non college trained guy, that could turn chicken poo into chicken pie. I have taken a few examples of his history here as people still think the man himself is here, I guess in spirit he always will be and of course the shop in Dale street down the road from me in Buena park will have his parts for ever. Who knows where he would be today if it wasnt for that tragic day in 1954 but i will never forget him that’s for sure. In fact, Clays original Cam grinding machine is still used in there to this day. Clay Smith, the legendary purveyor of speed during the early days of professional racing here in America is a gearhead guy you should know. He’s a more than worthy guy to be profiled. Heck, Smokey Yunick looked up to him. Yup, Smokey Yunick once dubbed Clay Smith, “the world’s smartest mechanic.” That’s something coming from a guy who was notoriously light on the compliments. Most people recognize Smith’s name and immediately think about the camshaft company and its famous logo. Mr. Horsepower, the pissed off looking, cigar chomping, bird was drawn up to be a cartoon version of Smith himself, a whimsical look at an intense and brilliant competitor. It’s been argued that the image of the red-headed fowl was the inspiration for Woody the Woodpecker. Smith’s mechanical education did not come from a university or a set of mail order books. He learned on the job by hand grinding cams. As legend has it, he was good enough and smart enough to tune each lobe to the cylinder it was to be working on. Smith worked for a man named Pierre Bertrand in his shop as a younger man. That experience, along with the experiences of racing, sunk the hook deep. In 1942 Bertrand died and Smith bought the company. It was renamed Clay Smith Engineering. We’ll skip right up to 1947 when Smith made his first big headlines. 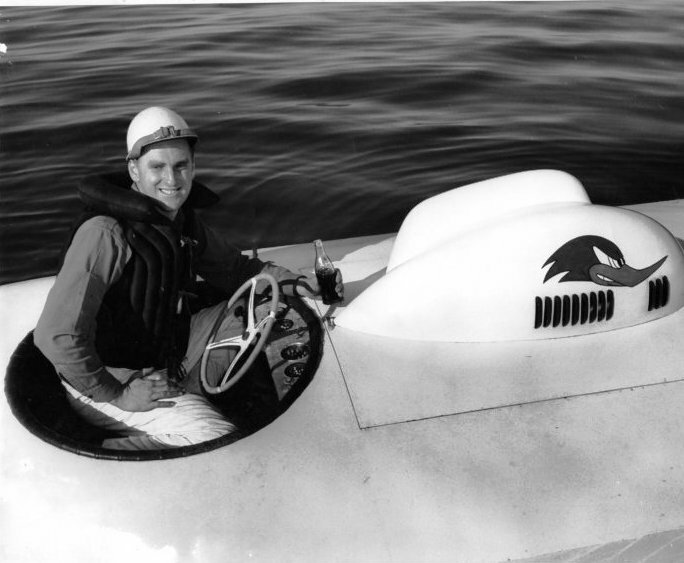 He teamed with Bill Stroppe to compete in a hydroplane boat race. Their machine was powered by a Ford straight six engine and they were repeatedly told that it was junk. The problems were numerous with the factory pieces. Oil starvation and vibration were two of the terminal problems with that particular motor. Smith solved them both and they won the event. So impressed were the people at Ford, they kept Smith on a sort of retainer to work on special projects, and they put him to good use. He took a stocker Mercury and tweaked it to get the best mileage possible, winning the 1950 Mobilgas Economy Run. Following up on that success, Ford had Smith and Stroppe prepare Lincolns for the PanAmerican Road race across Mexico. That was a harrowing adventure for drivers’ as well with lots of sharp turns and kinks. The big Lincolns dominated until the race was discontinued in 1954. During the time of the headline projects Smith was grinding cams and tuning engines for racers all over the country. He became one of the early household names of the hot rodding world. His crowning achievement was tuning Troy Ruttman to victory at the 1952 Indy 500. He had arrived. 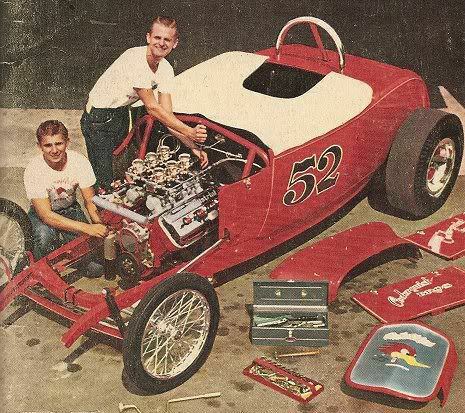 With the camshaft business booming and his tuning abilities being sought out by the biggest names in racing, it all came to a tragic end for Smith at an Illinois speedway in 1954. Roger Ward lost it on the front straight of the Du Quoin Speedway in Du Quoin, Illinois. His car careened into the pits, striking Smith and killing him. Smith had been Ward’s own crewchief in years past and the accident shook the steely Ward so hard he nearly walked away from auto racing forever. Clay Smith’s story is one of sadly unrealized long term potential. His accomplishments prior to passing were huge, so we can only imagine what he would have gotten done with decades more of life. There’s all the chance in the world that he’d be held in the same mainstream gearhead lexicon as Yunick and others of his ilk. We can only imagine the fun he would have had in the musclecar era. His company still lives in the hands of capable owners who are maintaining a legacy of quality and innovation. Clay Smith, another gearhead guy you should know. Just some more bits and bobs that I thought you would like about Mr Horsepower. Originally a mascot painted on Clay Smith’s boats and race cars, Mr Horsepower became the company logo as the reputation of Smith’s fine-tuned auto parts spread.Today, the Mr. Horsepower logo is commonly seen as a car decal, t-shirt logo, and many cool tattoos have been inked on Hot Rodders arms over the years.Some people have confused Mr. Horsepower with the cartoon character Woody Woodpecker. The notable points of contrast are that Woody Woodpecker’s beak is curved but smooth on top and bottom, and his head-feathers form a well-contained “V” shape in early iterations or a sprout of sorts in newer iterations. In the 75-year history of Clay Smith Cams, Striegel has owned it longer than anyone else. Striegel still uses an indexing machine, instead of a CNC machine to grind his camshafts. “We use two cam grinders, we do very little advertising and we count on our satisfied customers to spread the word. We build engines, engine kits, fuel pumps and rebuild distributors along with blueprinting heads, porting & polishing.” Striegel still owns Smith’s original cam grinder, which is hand-operated and uses an electric motor. “We design and build between 5,000 and 10,000 camshafts a year. We deal with custom engine builders, have performed work for Chrysler and Ford, normal street grinds and just about any application,” said Striegel, who operates with nine employees in about 10,000-square feet. He laughs and says he needs about 20,000-square feet. He says the company is growing, thanks in part to his daughter talking dad into selling clothing with the company logo: the cigar-chomping woodpecker. Today, Striegel continues to work, and recently built a 420-cu.in. small-block engine for his grandson’s 1972 Chevy Vega. “I originally built that car for my daughter after she wrecked my Corvette. We put the Vega in storage and gave it to my grandson, Nic, when he turned 16. He and I built the engine for his senior year project. It’s about 500hp, has an automatic transmission and an 8-3/4 Chrysler rear end.” Striegel said his grandson Nic is getting into the family-run business. “I think people will always love cars and want to go fast. George’s granddaughter Trayce will soon be racing her Super Comp Dragster-she is currently attending Cal State Fullerton and he hopes she will someday join the business,” said Striegel. “A camshaft is the heart and lungs of an engine. If an engine doesn’t have the right cam, it just won’t run right.” Clay Smith Engineering Company was founded in the late 40’s. Since that time, the company has strived to maintain the standards set up by Clay himself. Throughout the years, Clay Smith Engineering has continued to push the boundaries of engine performance through constant research and development. Following the death of Clay Smith in 1954, “Red” Wilson took over the reigns, and then in the 70’s, George “Honker” Striegel took on the challenge. In the 80’s and on into the 90’s George has established a Clay Smith Team dedicated to building quality products that set the standard for the industry. Joining him in this endeavor is his daughter, Sherry, whose goal is customer satisfaction through quality service and timely delivery and several other dedicated employees who support our motto. Little known side bar to the Clay Smith history. Speedy Bill Smith’s wife Joyce was so impressed with the California Mr. Smith, she named their second son “Clay” in his honor. True story…can’t make stuff like that up. This entry was posted in Blog and tagged bhra, bonneville, cam grinder, clay smith cams, flathead, hot rod, indy, street rod, vhra.